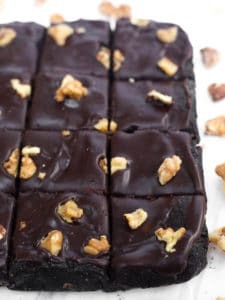 These healthy no-bake brownies are topped with chocolate ganache and they’re a decadent, satisfying treat made with whole ingredients. They also happen to be naturally gluten-free! Now that it’s February, I figured it’s time to share these amazing, healthy no-bake brownies in time for Valentine’s Day! 2. They taste really decadent, without being overly sweet. 3. They’re made with whole ingredients like nuts and dates, so they’re filled with protein and healthy fats! 5. 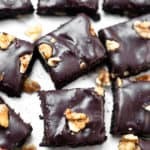 They’re naturally gluten-free and grain-free, and they’re also dairy-free if you use dairy-free chocolate in the ganache, so they’re great for suiting lots of different dietary needs! All you have to do is blend the brownie ingredients together in your food processor until a semi-smooth dough forms. Press the batter into a baking sheet (parchment or wax paper makes clean-up even easier! ), and place them in the fridge or freezer. 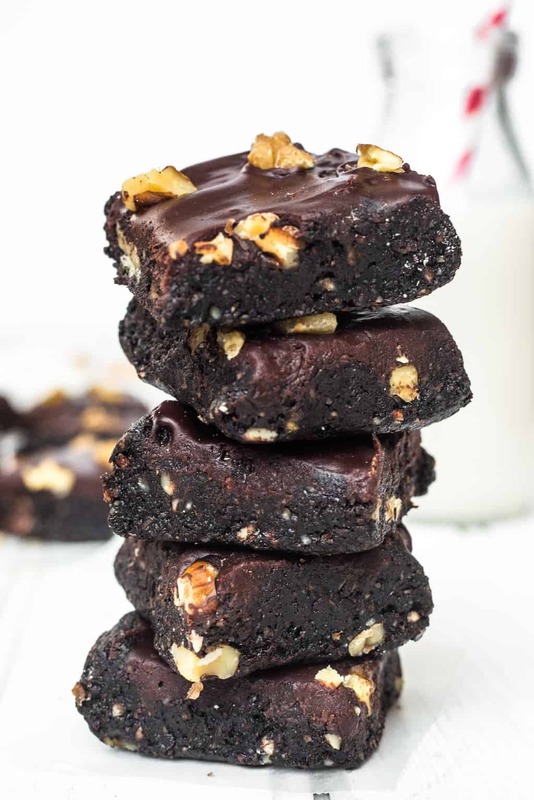 Then, whip up a simple chocolate ganache with chocolate, almond milk, and a tiny bit of coconut oil, spread it all over the brownies, and return them to the fridge or freezer for at least 30 minutes before enjoying. 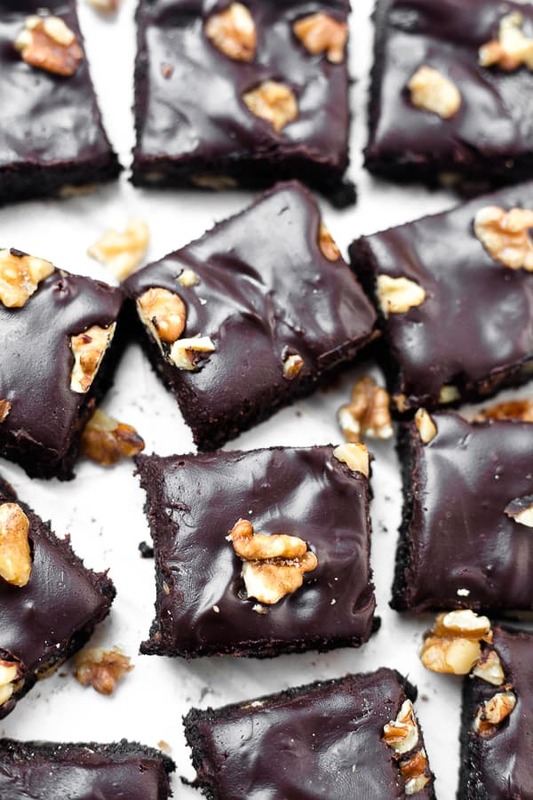 These raw brownies taste best when kept in the refrigerator or even the freezer. I hope you get a chance to make healthy no-bake brownies these for Valentine’s Day (or any day) for a great friend or a special someone! If you try these healthy no-bake brownies, feel free to let me know in a comment or take a picture and tag me @livbane on Instagram. Hope you LOVE them! Add all brownie ingredients to a food processor and combine on medium or high speed. The mixture will be crumbly at first, and then it will start to come together into a giant ball– stop the mixer at this point. Line a 8x8 inch baking dish with wax or parchment paper and press brownie mixture into pan. Place in refrigerator or freezer. Add almond milk to a small bowl and microwave for 30 seconds, until piping hot. Immediately add dark chocolate chips and coconut oil and stir once. Let chocolate sit and melt as much as possible, and if needed, microwave for 15-20 more seconds, and stir until chocolate is fully melted. Take brownies out of fridge/freezer and spread ganache evenly across the top. Return brownies to fridge or freezer for at least 30 minutes, or until ganache and brownies fully set. Slice into 16 squares and enjoy! Store in fridge for up to 2 weeks or freeze for up to 3 months. These look amazing Liv! Definitely need to make these since I am always looking for something sweet in the evening, but don’t want to overdo it on the sugar!! Yep, I have to have something sweet every night! Sometimes, I’m satisfied with fruit, but other times, I’m really craving either brownies like this or ice cream! Healthy brownies? I never knew there was such a thing! 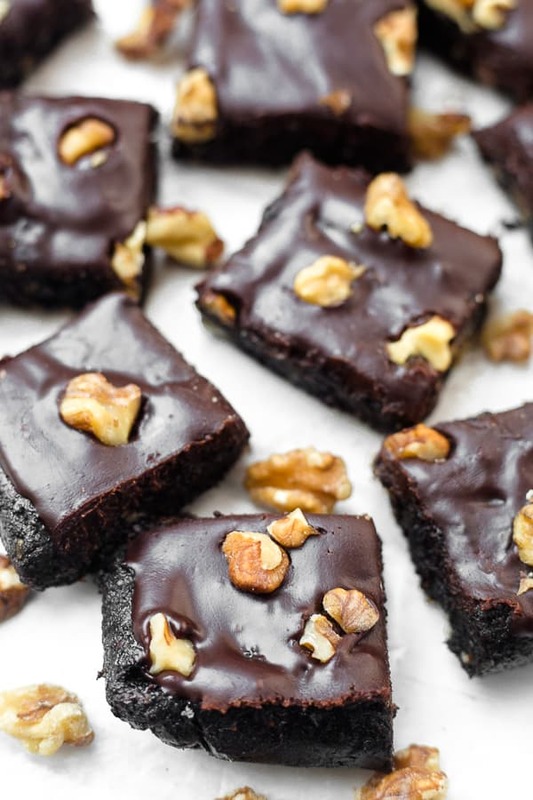 These look rich and fudgy — my husband would appreciate this recipe. Thanks so much for sharing this recipe, Traci!!! Oh my word! These look exactly like my definition of a perfect brownie: ultra fudgy with a bit of a crunch BUT without the guilt 😉 Plus I love that you eat them directly from the fridge, something about cold chocolate is so delicious, or is that just me?! I LOVE that these are no-bake! I am a huge fan of no-bake desserts but I don’t think I’ve ever tried no-bake brownies! I loved these so much when I tried them! Awesome recipe! These look incredible! I love no bake desserts and brownies happen to be one of my favourite desserts! Definitely going to have to give these a try! I agree, love no-bake desserts!! You are so creative. Brownies sound great. Must try. THE FUDGE FACTOR IN THESE IS INSANEEEEE Liv! 🙂 Sorry, but I had to get so excited when I went to your blog and saw these. These would be such a delicious fudgy treat for V-Day. Ohhh, these look so decadent and delicious! Yuuuummmm!! I love no bake treats for multiple reasons. One of them is that you can store them in the fridge for so long and they stay good! This is a game changer for me. 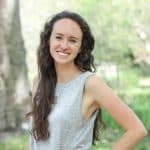 Thanks for sharing this recipe Liv! OMG! This looks insanely delicious and mouth-watering. I would love to try this and it’s very timely since I still do not have an oven in my new apartment. A no-bake brownie is jus perfect. so glad I found this! I literally picked up dates at the store the other day, thinking I bet you could make a no bake brownie using these! hahah didn’t have to search hard for a recipe! thanks! Oh, perfect timing!! Hope you love these brownies, Lexi!! These do look SO fudgey! Love that they are no bake too – great idea for Valentine’s treats! The fudge factor is unreal! Love ’em!! WOW these brownies look absolutely amazing! So chocolatey. YUM!